When our expectations are met and things go according to plan, we feel a sense of accomplishment and pride; we feel safe, in control, and on track. But when life does not live up to our expectations, we end up with an Expectation Hangover. This particular brand of disappointment is profoundly sobering and uncomfortable. Christine Hassler suggests that instead of wallowing in regret, self-recrimination, or anger, we can see these experiences as catalysts for profound transformation. When we learn to respond to Expectation Hangovers as students rather than sufferers, doorways to possibility open. Often it is only when life throws us a curveball (or several) that we look in a different direction. Rather than replaying and repeating these hangovers, we can move beyond disappointment and they can become catalysts for change. This is quite different from how most of us face our hangovers, which usually involves struggling to endure them until something or someone eventually comes along to make us feel better. Distraction is not the cure for disappointment. When we fully process our Expectation Hangovers on the emotional, mental, physical, and spiritual levels, we learn courage, faith, surrender, and love, and we make room for the kind of unexpected things that lead us more directly to a life we love. This is the guidebook for the person who craves inspiration but is full of doubt, who strives to live a life of meaning but is trapped in regret, who works hard to be happy but keeps bumping up against disappointment. 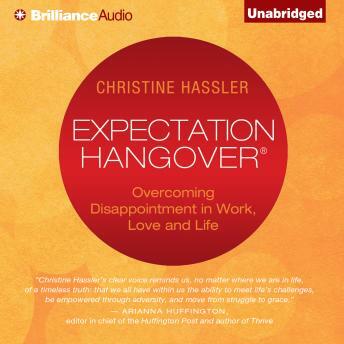 This is an audiobook for anyone who has ever had an Expectation Hangover—and that is everyone.